In Milan, an aperitivo hour is completely normal: when you go out for happy hour drinks, you tend to have full access to a bar loaded with totally delicious, free bites. In New York, where food is insanely expensive to begin with, free food is less of a standard-fare situation. To help you pretend you're Italian when the mood strikes and, more importantly, save you money, we rounded up all the best places to snack for free in town, so you're not stuck paying $3.50 for a bag of tortilla chips to go alongside your $9 light lager. But remember, guys -- these are businesses. Don’t just show up and eat the free food. Grab a beer or two with the money you just saved. 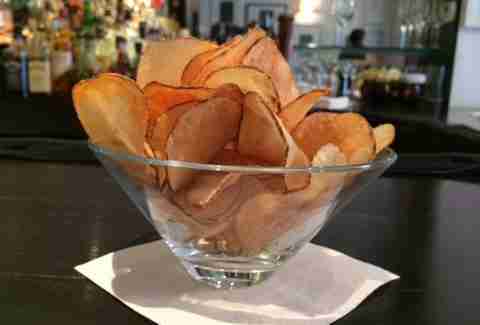 Grab a cocktail at one of the Il Mulino bars, and they’ll hook you up with some rosemary truffle oil potato chips that are not to be sneezed at. Or on, for that matter, because ew. Huckleberry Bar gets it: a movie without popcorn is barely a movie at all. It offers free popcorn during its Monday night movies -- which start around 9pm -- and also sell “Snackback specials.” Our favorite is the Smoke and Guns: a mezcal shot served with a beef jerky back. Available for your pleasure at Mad Donkey: unlimited free peanuts in the shell, accompanied by the feeling of abandon that comes with just throwing the empty shells on the floor. 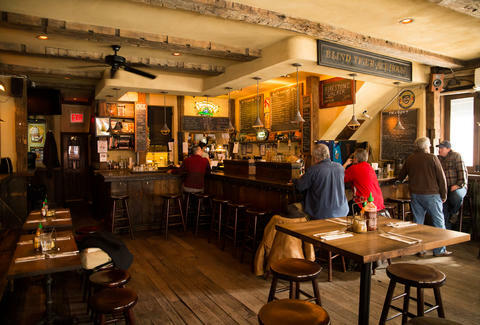 This place has one of the longest happy hour specials in New York: from 11am-7pm, Monday through Friday, you can get $4 wells, and $1 off all beer. These guys hand out complimentary bowls of Parmesan parsley popcorn at the bar. It's fancier than you are. Hot popcorn, cheap beer, chill local pub. Yes. Snag a super-cheap beer-and-a-shot combo, drop a couple of dollars into the killer jukebox, and grab a handful of tasty bar snacks: perpetually filled bowls of cheese puffs and Twizzlers. Popcorn all day, fewer corpses than advertised. 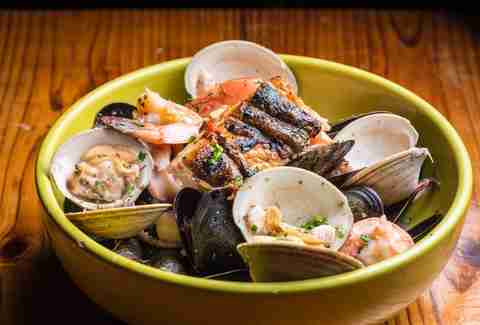 Come for a drink from 4-8pm and you may be gifted with some of its beautiful free mussels. Hit up happy hour (3-7pm) for $2 off draft beer and $5 well drinks, and at 5pm, the kind folks at Mullanes put out a hot tray full of food: sometimes you’ll get Swedish meatballs and mashed potatoes, other times roast beef sandwiches and French fries, pasta dishes… you name it. They only offer the one tray, though, so once it’s gone, it’s gone. From 5pm-late night, if you grab some drinks at the bar, this spot will hook you up with mixed olives, cheese, pita bread, and the occasional mini kebabs. Wednesday is free cheese day: from 6pm to as long as it lasts, you can try a selection from the famous Murray’s cheese, served with some fresh baguettes. Pair with a pint from the vast ale selection. In terms of the free food, this place is catch-as-catch-can, but if you get there during happy hour, which lasts from 5-8 Monday-Friday, you’re guaranteed $2 domestics, $3 premiums, $4 well drinks, and $2 off any cocktails, which is worth a trip in itself. Sometimes during happy hour, and frequently on Fridays, there’ll be a tray of snacks available: hamburgers, hot dogs, pasta... you name it. This place is like stepping into a goddamn time capsule. Treat the bartender -- who every blessed day wears a red waiter’s jacket -- with the respect the man deserves, and he may bring you a plate of meatballs served in a hot, vinegar-y sauce, and these thin-sliced, spicy, patatas bravas-type deals. Plus, the house red wine is cheap and totally drinkable. If you’re having a drink at the bar, you can ask for canapés -- that’s right, these are “canapés,” not “snacks,” because this is the kind of place where you should wear something other than a T-shirt emblazoned with the logo of a favored sports team. Be super nice and see what happens -- there’s the possibility that you may get served arancini with a truffled aioli, a sip of carrot and orange juice with lemongrass oil and a toasted rice froth, or an acorn squash tartlet with poppyseed chantilly. At the very least, they’ll offer you some of the unbeatable house-leavened sourdough bread that they make, which comes with homemade cream cheese and a finishing oil. It is just as snazzy as it sounds. Hit this spot for happy hour from 5-8pm on weekdays and score some free vegetarian appetizers. They’ll offer you whatever their delicious North Indian kitchen is making right then: mixed vegetarian fritters, mini samosas… they’re going to bring something out, it’s going to be spicy, and it’s going to taste hella good with a discounted beer. Become a regular and eat free three days a week. On Mondays, they’ll give you complimentary chicken wings from 5pm onward during games. On Wednesdays, grab a pint of beer (try the Brooklyn-brewed Kelso pilsner) and snack on a few different cheeses, accompanied with some grapes and crackers, because what are we, peasants? Sundays bring you bagels at noon, served with cream cheese, tomatoes, onions… really all the stuff you could expect to eat with a bagel for free. On Fridays, happy hour is accompanied by a free wing buffet from 4-7pm. What kind of wings you’ll be treated to changes every week depending on how the chef feels like preparing them, but you can bet on them being one of the standards: barbecue, Buffalo, or hot wings, and they’ll usually come out with fries as well. For the rest of the week, of course, wings only run you 20 cents a pop -- not exactly an insurmountable investment. A dingy, divey, New York classic: buy one of its super-cheap drinks (beers range from $3-$5), and treat yourself to a free hot dog. Play skee ball, drink beer, snack on free hot dogs. Here’s the scoop: it used to have soft pretzels, and it may go back to that, but for right now, sweet, sweet processed meat is still totally free. Which someone totally said, sometime, regarding something. 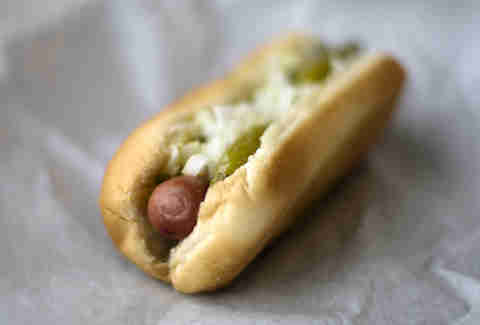 This beloved neighborhood dive not only offers cheap beer, it also has free, BEER-BRAISED hot dogs every Wednesday. Your first beer at this Italian local earns you a free small pizza. Plus the drafts are only $5 a pop all day, which is a solid deal all around. The classic. Get a free personal pizza with every drink you buy, every hour the place is open. You can buy toppings for $1. The other classic. A free personal pizza with every drink you buy, all night. It’s stupid good. Same topping situation. Same basic principle: with your drink, you get a thin-crust, super-crispy pizza straight from a big pizza oven, and it’s actually delicious. $1 per topping. The Charleston offers free pizza from noon-8pm, and after 8 it’s only $1, which you can totally handle. Pretzels all day long, and pizza every day at 6 and 10pm. This sports bar places a pizza order every Friday night around 7:30 based on the crowd size, and it’s first come, first served for whomever’s buying drinks. This dog-friendly dive has pizza delivered every Sunday for brunch, around 1, 2, and 4pm, plus a $5 make-your-own Bloody Mary bar. 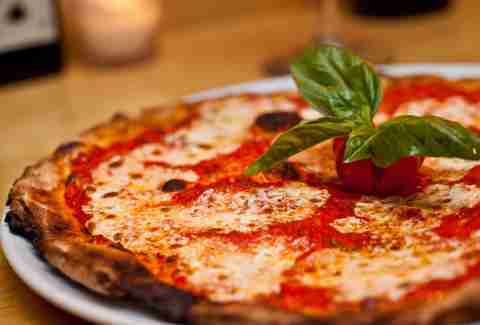 From 4-7pm, this sweet spot on SI offers two-for-one drinks and free pizza at the bar. The more you eat, the more pies the bartender orders, so come hungry (and thirsty). 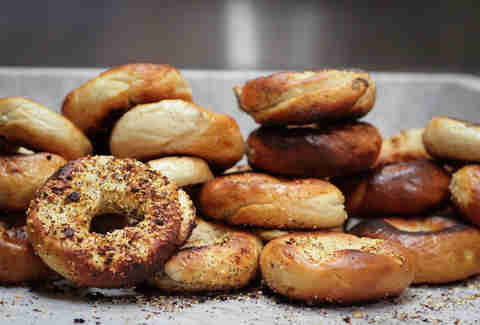 You can grab free bagels on Saturday and Sunday from noon clear to 8pm, which should take care of your hangover, no matter how late it runs. Plus, mimosas & Bloodys are only $4. And if you’re still in need of handouts from Matt Torrey’s, they’ll feed you free chili on Mondays at 8pm. On Saturdays and Sundays starting at noon, these guys have a free bagel brunch. This is a full-on bagel and cream cheese spread with cucumbers, tomatoes, jalapeños, red onion -- all the basic fixin’s. Plus you can grab $6 Bloody Marys and mimosas, or double down on your decisions from the night before with the Low Life special: $5 for a Budweiser and a shot of Evan Williams whiskey. Plus, it's got free popcorn 'round the clock. On the other hand, Despaña is a small, local store with a couple of locations that you shouldn’t take total advantage of. 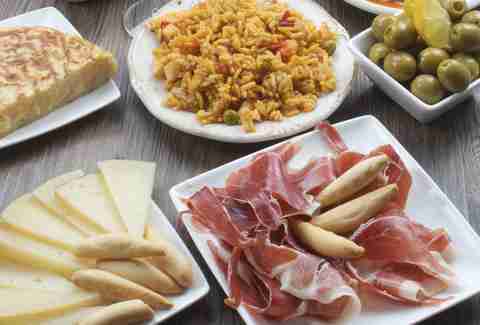 But try its samples of cheeses and meats, and then buy whatever strikes your fancy -- the hand-sliced Iberico ham is incredible. There’s always that nice person in the corner offering you little samples, plus there’s perpetual access to a mini cup of coffee. These guys are as famous for their samples as they are for overcharging customers. As we’ve noted before, they will also let you sample basically anything in their store for free. Plus, they’ve always got those plastic-covered domes with snacks in them. Feast away. It usually has free chocolate samples, but you’ll have to fight your way through the tourists at most New York locations to snag yourself a fistful of sweet victory/chocolate. Zabar’s is a New York icon, and for good reason. Take a taste of whatever it's offering up at the cheese counter, then buy some of the smoked fish -- it’s truly amazing. Nibble some apple slices and buy some produce that tastes about 10,000x better than it does from the grocery store. Jess Novak learned to just photosynthesize ages ago. Follow her on Twitter @jesstothenovak and Instagram @jtothenovak.